Chandler stayed home from school today with a "stomach ache". By about 9:00 a.m. I had him all figured out. I called his bluff and told him that he can't fool me. And then, he smiled. What's a mother to do? Well, this mother is going to let him finish that book that I am sure brought on the sudden illness. We'll call it "Spring Fever." Think he'll finish that book? Hilarious. Awesome. Kenzie's working on that same book. 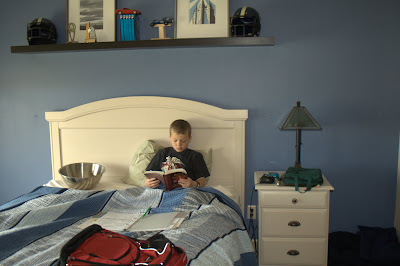 :) I love that color blue on his wall, what is it? Love it, love it! You are such a great mom! Even kids need a day off sometimes...so cute. not much to do on rainy days like this.